As Singapore progressed through the nation building years, the public housing landscape underwent a complex transformation. 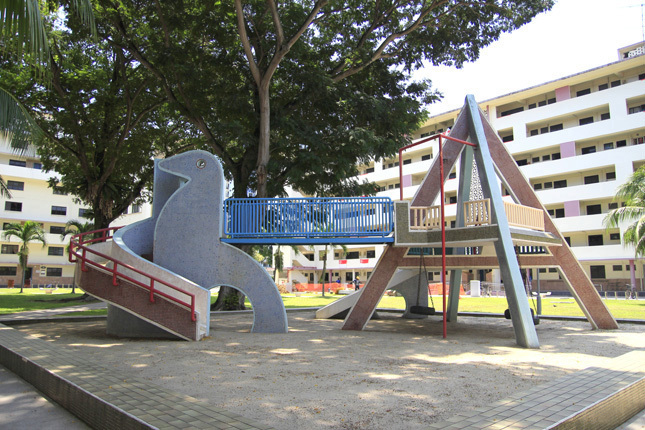 Former Singapore Improvement Trust’s low-rise 4-storey housing blocks gave way to the Housing and Development Board’s modern 30 to 40-storey high clusters; common play areas in the estates evolved, as playgrounds went from simple swings and see-saws in sandy pits to thematic plastic play sets on rubberised mats. As more high-rise compounds were built, fewer large open play-spaces for children were available. 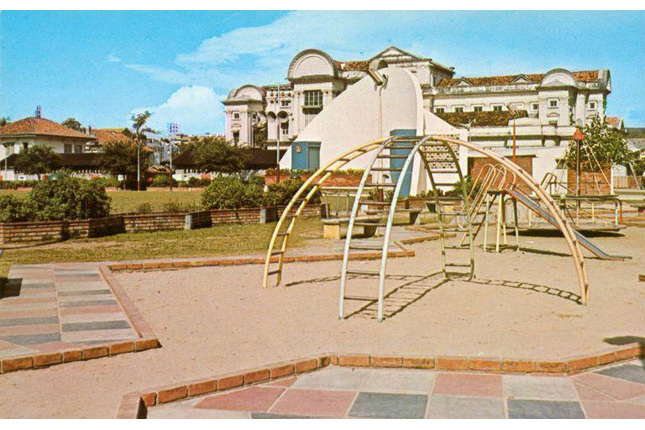 Hence, more playgrounds were needed for the young population growing up in these estates. For every 600 to 800 HDB homes, one playground was planned to cater for the residents. Concrete playground structures were designed and built in the 1970s to replace the older basic functional swings and merry-go-rounds. 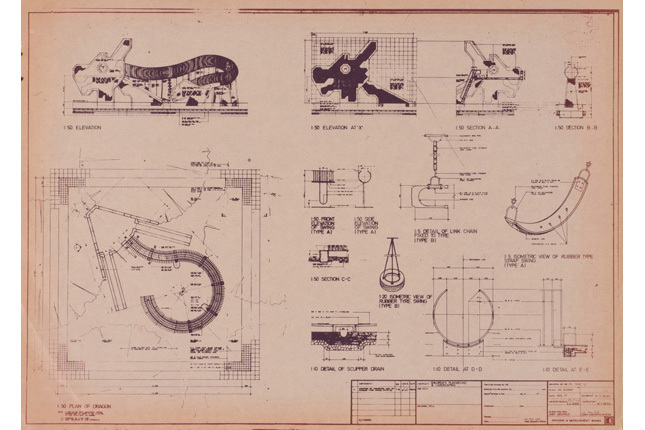 These playgrounds would feature geometric designs or animal and fruit shapes. 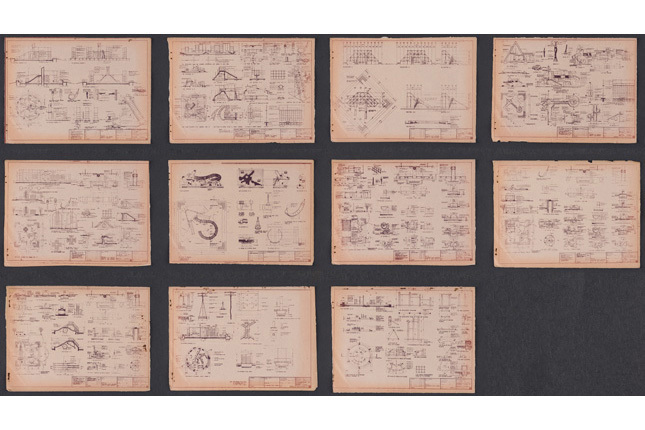 Some of these playground designs also paid tribute to the estate’s place history. 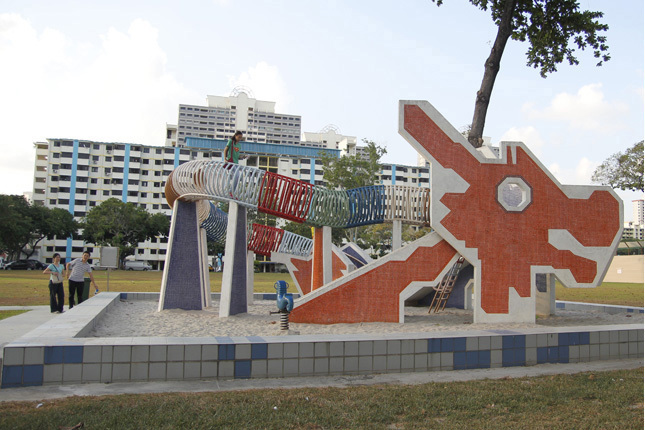 For instance, the fruit playgrounds at Choa Chu Kang and Tampines were reminders of the area’s former fruit farms. Take a virtual tour of the dragon playground at 28 Lorong 6 Toa Payoh. 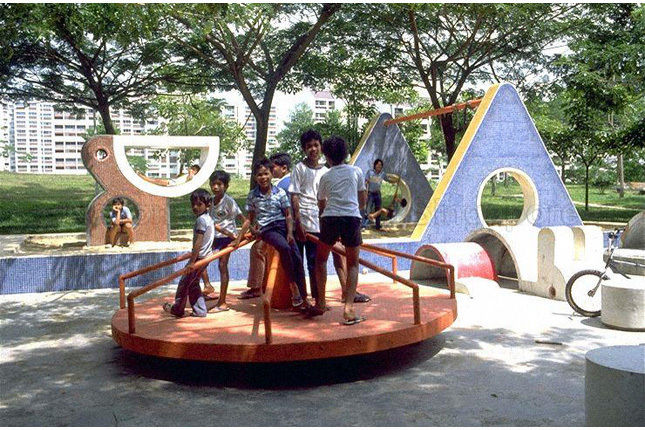 Many of these playgrounds of the 1970s and 1980s were the work of former HDB in-house designers like Mr Khor Ean Ghee. 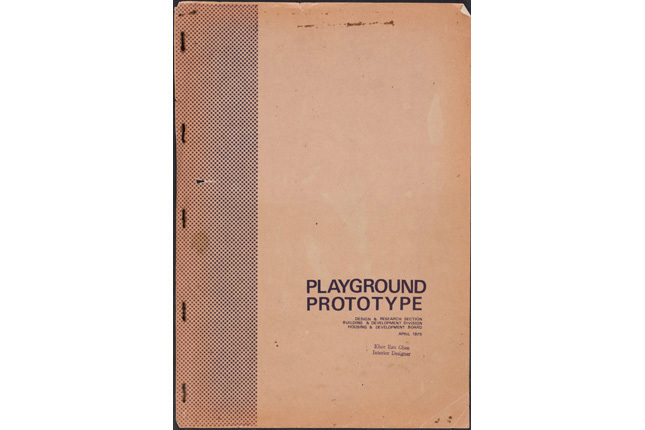 In the 1980s, thematic designs emerged and it was common to see playgrounds centred on themes of dinosaurs, fairytales and nursery rhymes. 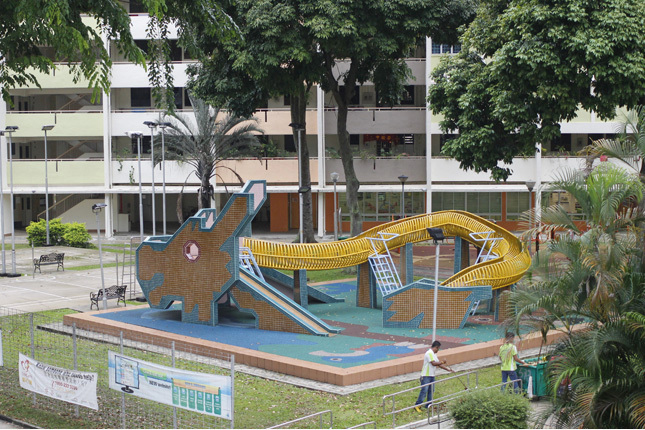 By the turn of the 1990s, HDB outsourced playground designs to architectural consultancy firms. With more safety guidelines kicked in, sandy pits soon gave way to rubber mats. 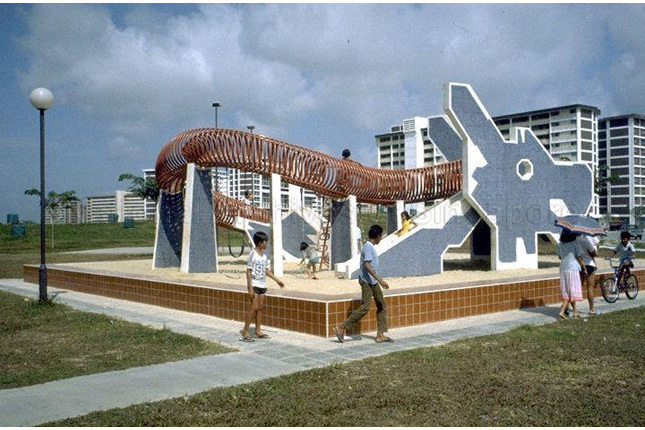 Concrete structures and mosaic tiles were replaced by plastic modular playgrounds, which were considered to offer safer and more hygienic conditions for children. Family bonding also became the directive in the 21st century and modern playgrounds were integrated with fitness areas. This ensured that the common space catered for a multi-generation experience for families. Today most of these playgrounds found in housing estates are standard plastic play-sets with rubber mats. There are fewer than 20 playgrounds of the past to remain, making them a cherished play entity from our yesteryear.